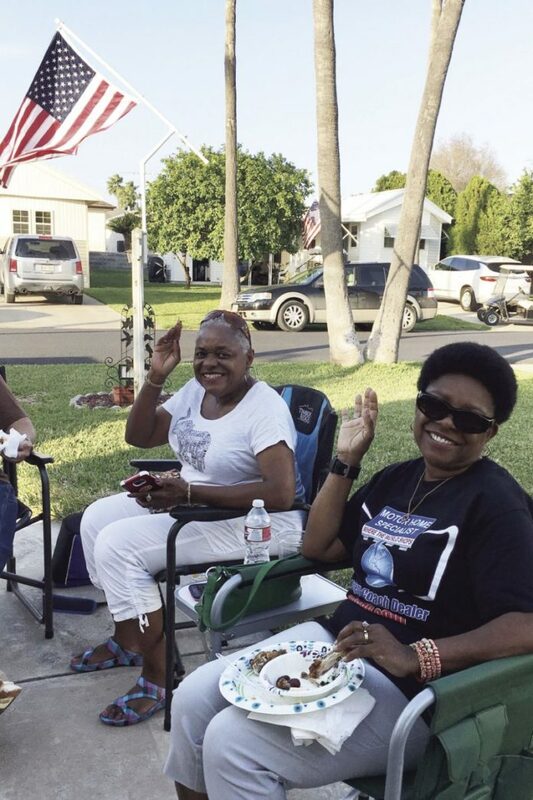 National African-American RV’ers Association members Celestine Wilson and Beverly Dailey enjoy a meal outdoors during their stay as Winter Texans in the Rio Grande Valley. MISSION — After an unpredictable and uncooperative winter, the 11 remaining members of the National African-American RV’ers Association, or NAARVA, are enjoying the last of their Fridays in the Rio Grande Valley with barbecue potlucks. These gatherings are hosted outside the unit of a different member every week and serve as a time to recount the latest happenings while developing future plans. NAARVA member and Missourian, Carolyn Buford, and her husband Luther have been migrating to Mission for eight years. They joined in fall 1996 and are also members of a group in Kansas City called the Roadrunners. The organization began 26 years ago and exists as the largest gathering of primarily African-American RVers. Chapters exist in nearly every state; some of the local, seasonal travelers have already returned home. Some hailed from Tennessee and Mississippi. Toni Revis makes the days-long voyage from New Jersey with her travel companion — a parrot named Henrietta. Members reside at four different RV parks but maintain an agenda full of activities, including line dancing, bingo and scouring flea markets. “We’re all electronically connected,” said Buford. A favorite activity of Beverly Dailey from St. Louis is thrift shopping. “I’d do (thrifting) seven days a week if I can,” she said. One of her greatest finds was an afghan that retails online for approximately $30; she snagged it for $2.19 and consistently finds favorite brands of herself and her mother. Dailey has also taken up the art of Swedish weaving. The products, she said, make for great gifts. This crafting passion is shared by Charles Wilson, who visits from St. Louis with his wife Celestine. He showcases his work at local conventions. “If you don’t like where you are you turn your key,” Buford said about the perks of being an RV owner and dedicated traveler. The culture of the Valley is very welcoming and the group is actively working to learn Spanish because, “When in Rome, do as the Romans do,” she said. Regional cuisine, such as cabrito — goat — and “dinosaur ribs” served by a local restaurant, are some of the favorite new food items they have tried. Visits to Nuevo Progreso, Mexico, have been another enjoyed outing. Before enjoying their dinner hosted outside of Margaret and Eugene Hill’s unit, they held hands and prayed. Husbands gathered near the grill and listened to streaming radio. Orange trees occupy the lot and an American flag waves on the front lawn. Many of the visiting NAARVA members attend local Catholic churches. Although they’re Winter Texans, it’s not uncommon for members to be confused for immigrants from South American countries. “There is a difference in the type of reception you’ll receive,” said Buford. Most of the Valley guests will be returning home the second week of March. A few have plans to make another stop or two before returning home.